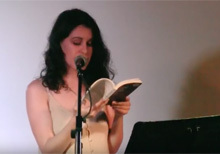 Catherine Fatima reading from Sludge Utopia at the Book*hug Spring 2018 Launch. 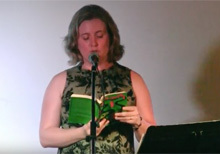 JC Sutcliffe reading from her translation of Mama’s Boy by David Goudreault at the Book*hug Spring 2018 Launch. 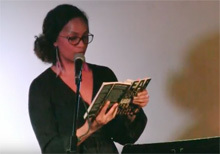 Chelene Knight reading from Dear Current Occupant at the Book*hug Spring 2018 Launch. 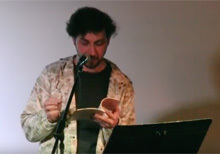 Aaron Giovannone reading from The Nonnets at the Book*hug Spring 2018 Launch. 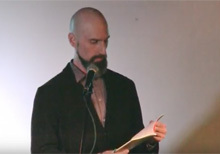 Jacob Wren reading from Authenticity is a Feeling: My Life in PME-ART at the Book*hug Spring 2018 Launch. 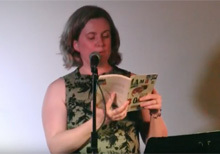 JC Sutcliffe reading from her translation of Document 1 by François Blais at the Book*hug Spring 2018 Launch. 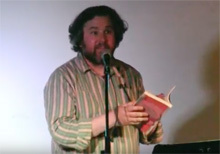 Steven Zultanski reading from Honestly at the Book*hug Spring 2018 Launch.